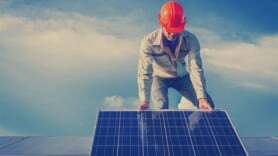 Solar power could end up being as cheap as power from the grid across large swathes of the United States in less than a decade, claim industry experts. The prediction is based on the assumption that as the cost of solar panels and installation keep moving down, the transportation costs of electricity move up. He was speaking ahead of The Solar Future Eastern USA ’12 conference in New York next month.